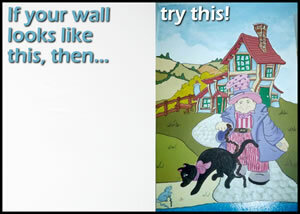 Hey-Fresco Murals have undertaken murals which enliven supermarket walls, nursery schools, surgeries and restaurants as well as domestic properties. Commissions for private residential clients range from children’s bedrooms to external garden walls and even ceilings with sky scenes or complex and intricate religious works painted around chandeliers. Nikki’s portfolio is truly stunning and includes murals ranging from wild and sea life scenes to amazing examples of the trompe l’oeil (trick of the eye) technique, outer space to cartoon scenes and nursery rhyme stories depicted in infants’ school rooms.